Few would dispute the enduring success of the English legal system. For several centuries it has served as the example for a number of legal systems around the world, not the least of which are those of Australia, Canada and the United States. England has a well-developed common law and an independent and respected judiciary. England has litigation procedures that are considered fair and effective and its judgments are respected and easily enforceable outside the UK. England is a global leader in arbitration and well as in corporate legal services, its global leadership position reinforced by its low barriers to entry for foreign lawyers and firms. Yet, in spite of its centuries as a beacon for other legal systems, few would dispute that, by the early 2000s, in many ways the English legal system was a mess. A big mess. In just what ways was it a mess? That would depend on who you asked. If you asked the Legal Services Ombudsman, you would hear that there was an unacceptably high number of complaints—there was one complaint for every five practicing solicitors and for every 22 practicing barristers. And these complaints demonstrated recurrent failings in service delivery: excessive delays, excessive costs, poor responsiveness to communications, failure to follow instructions, failure to act in the client’s best interest, and failure to clarify the implications of proposed actions. In addition, the multi-stepped and multi-layered complaints process placed “an unacceptable and disproportionate burden” on complainants—it required a “degree of patience, tenacity and endurance” such that only “the most determined complainants” would not be deterred from seeking redress. Exacerbating this problem was the fusion in the same regulatory body of both regulatory and representative functions, which created an “inevitable conflict of interest” with the body driven by the interests of its members rather than by the interests of consumers. Figure 3.1: The system for the regulation of legal services in England and Wales prior to the implementation of the 2007 Legal Services Act. 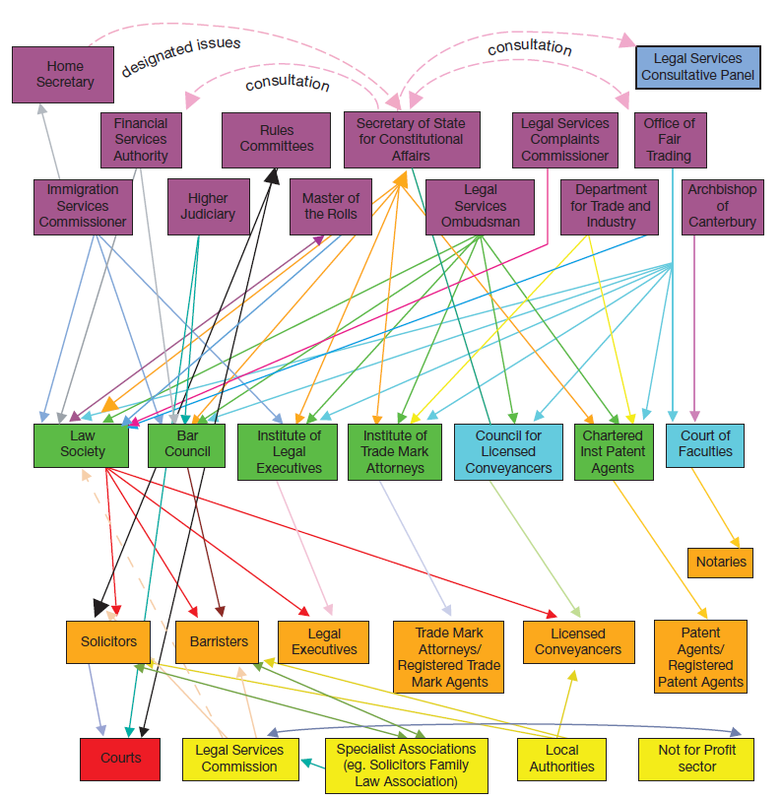 Source: Department for Constitutional Affairs, “The Future of Legal Services: Putting Consumers First,” October, 2005, 11, http://webarchive.nationalarchives.gov.uk/+/http://www.dca.gov.uk/legalsys/folwp.pdf. If you asked the Office of Fair Trading (“OFT,” comparable to the US Federal Trade Commission), you would hear that methods of supply of legal services were a mess: that they resulted in unacceptable restrictions on competition that could not be justified for reasons of public interest or economic efficiency. While, in a 2001 report, the OFT cited many restrictions, they most notably pointed to restrictions on multi-disciplinary practices (MDPs) and on lawyers employed by nonlawyers from providing services to third parties. For example, the OFT stated that if MDPs were allowed, they might “achieve advantages in branding, overhead cost savings, and the ability to transfer resources in response to fluctuations in demand and to give a seamless service to clients.” Further, the opportunity to provide combinations of different kinds of professional services from the same structure “should unlock potential cost efficiencies and enhance customer choice and convenience.” In addition, allowing solicitors to be employed by non-solicitors “could allow competition from those suitably-qualified working in different business structures,” and concerns about regulating solicitors employed by non-solicitors could be met by a system where business structures rather than individual practitioners were regulated. It was in this context that the Government decided that “a thorough and independent investigation without reservation” was needed. The purpose of the investigation was multifold: (i) to consider what regulatory framework would best promote competition, innovation and the public and consumer interest in an efficient, effective and independent legal sector, (ii) to recommend a framework which will be independent in representing the public and consumer interest, comprehensive, accountable, consistent, flexible, transparent, and no more restrictive or burdensome than is clearly justified, (iii) to review how business entities such as MDPs and corporate bodies can operate in the legal services market and how such entities are best regulated, and, more generally, to examine more efficient ways of liberalizing the market. The person selected to conduct the investigation was Sir David Clementi. Trained as an accountant, he was a respected former deputy Governor of the Bank of England, and was then serving as Chairman of Prudential plc. 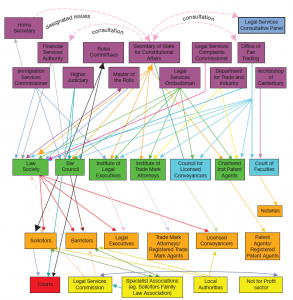 What were the appropriate objectives of a regulatory system for legal services? Whether a regulatory system should see a clear distinction between the regulatory and the representative role of a professional body? Whether the mechanism for handling consumer complaints is better organized within the professional bodies or outside, reporting to an independent regulator? What demand and what advantages and disadvantages exist in respect of alternative business structures? Clementi received 265 written responses to his consultation paper, including, without surprise, from the Law Society of England and Wales and from the Bar Council (which, at that time, served in both representative as well as regulatory functions of solicitors and barristers, respectively). Clementi met the deadline for the completion of his investigation, issuing what is now referred to as the “Clementi Report” in December 2004. The organization of Clementi’s 139-page report neatly mirrored the three principal issues mentioned above—namely, reform of the regulatory framework, reform of the complaints system, and reform of the restrictive nature of business structures. In addressing the issue of the regulatory framework, Clementi began with the question of what the objectives of a regulatory regime should be. He stated that clarification of regulatory objectives is “critical” for those charged with regulatory responsibility, since the objectives represent the criteria against which they must determine the appropriate regulatory action, and the criteria against which they will be held accountable. In its response to the consultation paper, the Bar Council stated that, for it, the basic purposes of regulation were to seek to ensure that members of a professional body are suitably qualified and observe appropriate ethical standards. But Clementi rejected this narrow description as being “a rather profession centric view.” Instead, in his report, Clementi listed six objectives for legal service regulators and recommended that they provide the core around which a regulatory framework for legal services be built. The rule of law embodies the basic principles of equal treatment of all people before the law, fairness, and a guarantee of basic human rights. A predictable and proportionate legal system with fair, transparent, and effective judicial institutions is essential to the protection of both citizens and commerce against any arbitrary use of state authority and unlawful acts of both organizations and individuals… [T]hose charged with regulating legal service providers should have an important part to play in ensuring the rule of law by creating conditions necessary for its delivery. Access to justice has [a variety of dimensions but it is critically] an issue about access for those who are disadvantaged and in particular those who cannot afford to pursue their legal rights. The regulator of legal services should have a twin duty in respect of consumers: first to ensure that consumers have sufficient information about the standards of the services provided so that they are able to take informed decisions about these services; and second, given that consumers may not always be ‘informed’, to have powers to act in the market, for example, to prohibit oppressive marketing practices, raise or set standards, develop information/awareness programs, resolve disputes and protect vulnerable groups. Any Regulator of legal services should have as an objective the prevention of unjustified restrictions on the supply of, and encourage competition in, the provision of legal services and the promotion of choice in both the number and type of providers, subject to the proper safeguard of consumers’ interests. The regulatory objective of maintaining a strong and effective legal profession (including setting appropriate entry standards and supporting new entrants to the market) [will] help to ensure access to justice, the maintenance of a healthy supplier base for publicly funded work and continued support for pro bono initiatives, thereby serving the public interest. It would also underpin the international efforts of our legal sector. [Clementi considered that the Bar Council’s limited objectives would be covered by this one]. The regulator should maintain the professional obligation on lawyers to set out for clients their rights and the consequences of different options. Having explained his recommendations for the objectives of a regulatory regime, Clementi then turned to the regulatory model itself. He began by agreeing that “the current system is flawed.” For him, this was due to a number of reasons, not by any means limited to the large number of regulatory bodies and their overlapping functions that others had cited. For Clementi, the problem was much larger than that: The regulatory system had no clear objectives or principals, and it had insufficient regard to the interest of consumers. Clementi agreed that the complaints system was also flawed, as regards its efficiency, as regards the overlapping powers of the oversight bodies, and as regards the principle of the system itself, questioning whether a system for complaints against lawyers that is run by lawyers themselves could achieve consumer confidence. Finally, Clementi’s third area of concern was about the restrictive nature of the permitted business structures for legal services. He observed that they had changed little over a long period of time, with its most easily recognizable structure as the sole practitioner or partnership of lawyers. But business practices have changed, he argued. Notably, the skills necessary to run a modern legal practice have developed; but while those with finance or IT skills may sit on the management committee of a legal firm, they were not permitted to be principals in the business. Clementi observed that the concerns he outlined are related to each other. Notably, he pointed out, one of the difficulties which stands in the way of new business structures is that the current framework does not easily allow for their regulation. Each type of “economic unit” that can embody a legal service has its own advantages and disadvantages. He rejected the suggestion that any one type of economic unit, be it a sole practitioner, unlimited partnership, limited liability partnership, or company, would be better than another for serving the interests of consumers and the public. To the contrary, he favored a regulatory framework which permits a high degree of choice: choice both for the consumer in where he goes for legal services, and for the lawyer in the type of structure he works for. It is wrong to assume that high quality legal services can or should only be provided at high cost. Clementi stated high quality legal services are important to society, but of limited value if available only to the very rich or those paid for by the government. In developing business systems to minimize costs while maintaining high standards, there is no reason why lawyers should not work alongside those with other skills, for example in finance or IT. Reforms can be developed that both encourage cost-effective practices while maintaining both quality and ethical standards. His first principal recommendation was that representative and regulatory functions should be clearly separated into different bodies. Clementi stated that this change was needed to protect public and consumer interest, to promote competition and to encourage innovation. For Clementi, it was not possible that the same body could both effectively regulate a profession at the same time that it was also charged with representing it and lobbying for its interests: “There is a conflict of interest between the two roles which should be tackled.” Specifically, in a regulatory body the public interest should have primacy, and issues such as changes in practice rules should be examined, not against the wishes of the membership, but against the test of public interest. Further, he stated, it is particularly difficult for professional bodies that combine both regulatory and representative roles to deal with competition issues. Regulatory bodies should be expected to encourage open competition, subject to maintaining quality standards; representative bodies have a legitimate right to fight their corner, warning that the public may suffer if the market is opened too widely. This is a difficult set of conflicting issues for one body to balance. Indeed, Clementi observed, both the Law Society and the Bar Council had demonstrated difficulty in getting significant practice rule changes approved by their representative councils. Clementi’s second principal recommendation with respect to regulatory bodies was the establishment of a Legal Services Board (“LSB”), charged with the oversight of the “frontline” regulatory bodies. Clementi called this structure Model B+. In making this recommendation Clementi also considered an alternative, called Model A, where all regulatory power and authority across all legal professions (solicitors, barristers, etc.) would be invested into one single authority. However, Clementi rejected Model A in favor of Model B+, for a variety of reasons, notably, in his opinion: (i) leaving day-to-day rule-making and oversight as far as possible at the practitioner level is more likely to increase the commitment of practitioners to high standards—so they see rules as aids to raise standards and not as constraints to be circumvented; (ii) leaving day-to-day rule making and oversight at the practitioner level more clearly demonstrates the independence of the legal profession from the government; (iii) consistency among rules can be sufficiently guaranteed by the LSB setting minimum standards—this then permits for appropriate variations in standards depending upon the legal profession in question, (iv) Model B+ provides greater flexibility for the LSB to be empowered to, for example, authorize new regulatory bodies to come into existence and/or to modify their mandates. Greater flexibility, notably in order to accommodate alternative business structures. Clementi recommended that the LSB have oversight over the OLC, but that such oversight should be limited to systemic and policy issues, without encompassing individual complaints. Finally, Clementi recommended that the OLC have a board structure, the majority of which, as well as the Chair, should be nonlawyers. Clementi’s recommendations in this regard were to move forward in two stages. The first, arguably modest, stage should be to permit lawyers regulated by different professional bodies (notably, but not exclusively, solicitors and barristers) to practice together as equals in the same structure (at the time the Clementi Report was issued, this was not permitted). Clementi referred to these structures as Legal Disciplinary Practices (LDPs), and further argued that outside ownership of them should be permitted, subject to certain regulatory verifications that such owners are fit to own, and, especially, that their managers are fit to manage. Clementi recommended that in regulating LDPs, the focus should be on the economic unit rather than on individual lawyers, and a determination of the LDPs authorization to practice would include an examination of its governance and administrative arrangements. It is only once a regulatory system for LDPs has been established, Clementi stated, that regulatory authorities should then consider moving to the second step, of authorizing multi-disciplinary practices (practices that bring lawyers together with other professionals to provide a combination of legal and non-legal services to third parties). In the context of a market where restrictive practices operate as a barrier to innovative forms of service delivery, the absence of an articulated consumer demand is not, in itself, a persuasive argument that other forms of service delivery should not be permitted. Further, even if consumer demand is not articulated directly as such, it can be observed in the attitudes and fears that many people have with respective to lawyers and legal services: that legal services are too expensive, that lawyers are often difficult to approach and to understand, that lawyers provide poor customer service. Clementi cited existing examples of different types of legal professionals already working together with nonlawyers in management positions, in manner that did not compromise professional standards. The examples he cited were the many legal practices where professionals with IT, HR and finance skills already sat on the Executive Committees of their firms, and also Law Centers (organizations that provide legal assistance to persons in the UK who cannot afford a lawyer). Finally, Clementi argued that it should be possible to address ethical concerns through regulation, and notably by shifting emphasis towards regulation of the economic unit rather than of the individual practitioner. Clementi rejected arguments that “widening the net of ownership” led to greater risk. To the contrary, he responded that many shareholders would bring business practices to firms that would improve the standards of many firms, and notably higher levels of internal controls. That being said, Clementi recommended that prospective outside shareholders be subject to a “fit to own” test. While he deferred to the regulator to fix the parameters of such a test, he suggested that it would consider honesty, integrity and reputation, competence and capability, and financial soundness. He further suggested that the regulator would be entitled to look at the business plan of the prospective owner and to understand what type of practice it wished to run and why. Further, in a group context, Clementi stated that the regulator should have the right to look beyond the immediate shareholder, for example to the ultimate beneficial owner. Clementi rejected the Bar Council’s argument that “a conflict would inevitably rise between the commercial interests of the owners and the ethical duties on which the practice of law is based.” Clementi stated that with proper safeguards in place, it is not at all inevitable that this would happen. Further, he continued, clients are not fully protected from unethical actions as it is today, as witnessed by the reports of the Solicitors Disciplinary Tribunal, which lists the names of those who have been struck from the Roll for malpractice and criminal behavior. Immediately after Clementi issued his report in December 2004, the Government “warmly” welcomed it, and stated that it “broadly” accepted the report’s main recommendations, as well as the arguments for change that it set out. In October 2005, the Government issued its own White Paper, in which it described more fully its reaction to the Clementi Report, and explained the Government’s agenda for reforming the regulation and delivery of legal services in England and Wales. Finally, in May 2006, the Government circulated its draft Legal Services Bill, together with explanatory notes and a regulatory impact assessment. The Bill was the subject of the extensive scrutiny and debate, and as a result it exploded in size: In its first incarnation, the Bill contained 159 clauses and 15 Schedules, but by the time it emerged from Parliament in 2007, it had grown to 214 sections and 24 Schedules, filling up 389 pages. In fact, both the Law Society and the Bar Council implemented certain of Clementi’s recommendations even before the circulation of the Bill. Notably, each of them split their regulatory and representation functions, with the creation of the Solicitors Regulation Authority in 2005 and the Bar Standards Board in 2006. (However, the separation was only operational, and yet today the SRA and the BSB both remain housed under the Law Society and the Bar Council, respectively. As explored below, this incomplete independence remains today a point of contention). The elements of the Bill that sparked the most concern and discussion were those considered to have diverged too far from Clementi’s recommendations. The most notable debates centered on the extent to which the independence of the legal profession from government would be assured, and the process for complaint handling. With respect to the independence of the legal profession, for example, the Law Society objected that the first draft Bill gave the Lord Chancellor (a high-ranking government function) the sole power to make appointments to the LSB without consultation. And both the Law Society and the Bar Council complained that the first draft Bill gave the LSB wide powers to intervene in the work of the front-line regulators, in contrast to the “light touch” recommended by the Clementi Report. Presumably in response to these comments, the final draft Bill provided that the Lord Chancellor may make appointments to the LSB only upon consultation with the Lord Chief Justice (a person selected by the non-departmental public body called the Judicial Appointments Commission), and it clarified both that primary regulatory responsibility rests with the front-line regulators, and that the LSB may interfere only when their actions are unreasonable. (i) The impact that ABSs were predicted to have on access to justice: Some argued that ABSs would decrease access to justice because they would cherry-pick the most profitable work, leaving the less profitable work to existing firms, driving them out of business. It was considered that this concern would be mitigated by requiring the front-line regulator to take account of the regulatory objective of access to justice in considering an application for an ABS license. (ii) The cost of regulation: There was strong debate over who should cover the costs to establish the new regulatory bodies, and who would pay for their operation. The Government’s position, and the position that prevailed, was that it would be the legal service providers, via fees levied by the regulators. Their support of ABSs was not without reserve—for example, the Law Society emphasized that ABSs should be subject to the same regulations as other structures, and the Bar Council stressed that the regulations should assure proper standards of conduct by lawyers and nonlawyers alike. Sir David Clementi: Clementi explains why he was chosen to prepare a report on the regulatory system for lawyers, and his approach in preparing the report. Some efforts to reform were attempted even sooner, in 1989. See: Richard Devlin and Ora Morison, “Access to Justice and the Ethics and Politics of Alternative Business Structures,” The Canadian Bar Review 91 (2012): 508-511, http://ssrn.com/abstract=2437035. This article also contains an excellent review of the larger historical and political context in England and Wales. Ibid., 508-525. Paul Paton has provided a succinct review of the events that led to the adoption of the Legal Services Act. See Paul D. Paton, “Between a Rock and a Hard Place: The Future of Self-Regulation—Canada between the United States and the English /Australian Experience,” Journal of the Professional Lawyer (2008): 97-104, https://ssrn.com/abstract=1226802. Michael McLaren and Marianne Butler, “Origins of the Legal Services Act 2007,” in Guide to the Legal Services Act 2007, ed. James Thorne and Iain Miller (UK: LexisNexis, 2009), 2. Department for Constitutional Affairs, “The Future of Legal Services: Putting Consumers First,” October, 2005, 8, 94, http://webarchive.nationalarchives.gov.uk/+/http://www.dca.gov.uk/legalsys/folwp.pdf. Director General of Fair Trading, “Competition in Professions,” March, 2001, 30, http://webarchive.nationalarchives.gov.uk/20140402142426/http:/www.oft.gov.uk/shared_oft/reports/professional_bodies/oft328.pdf. “Government Conclusions — Competition and Regulation in the Legal Services Market: A Report Following the Consultation ‘In the Public Interest?’” July 2003, http://webarchive.nationalarchives.gov.uk/+/http://www.dca.gov.uk/consult/general/oftreptconc.htm. David Clementi, “Consultation Paper on the Review of the Regulatory Framework for Legal Services in England and Wales,” March, 2004, http://webarchive.nationalarchives.gov.uk/+/http://www.legal-services-review.org.uk/content/consult/review.htm. McLaren and Butler, “Origins of the Legal Services Act 2007,” 3-4. David Clementi, “Review of the Regulatory Framework for Legal Services in England and Wales: Final Report,” December, 2004, http://webarchive.nationalarchives.gov.uk/+/http://www.legal-services-review.org.uk/content/report/report-chap.pdf. Lord Falconer of Thoroton, “Legal Services: Clementi Report,” written statement to House of Lords, December 15, 2004, http://hansard.millbanksystems.com/written_statements/2004/dec/15/legal-services-clementi-report#column_83ws. Department for Constitutional Affairs, “The Future of Legal Services,” 94. McLaren and Butler, “Origins of the Legal Services Act 2007,” 10. “Memorandum by the Law Society of England and Wales,” Joint Committee on the Draft Legal Services Bill Minutes of Evidence, June 2006, http://www.publications.parliament.uk/pa/jt200506/jtselect/jtlegal/232/6060802.htm (“Law Society Memorandum”). “Memorandum by the General Council of the Bar,” Joint Committee on the Draft Legal Services Bill Minutes of Evidence, June, 2006, http://www.publications.parliament.uk/pa/jt200506/jtselect/jtlegal/232/6060812.htm (“Bar Council Memorandum”). “Supermarket ‘Law Shops’ to Sell Legal Services,” BBC News, October 6, 2011, http://www.bbc.co.uk/news/uk-15187154.